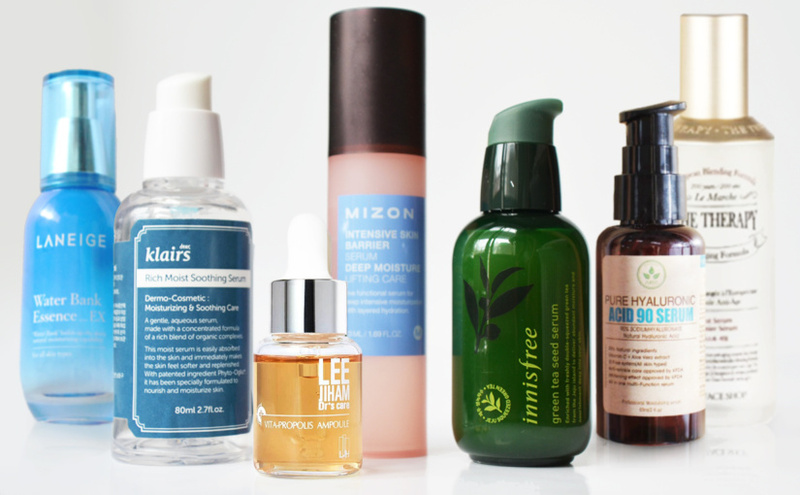 Some of you guys have asked me about light, fresh & hydrating Korean serums for the summer. Here are my top best tips! In the summer, many adjust their skin care routine by adding light refreshing products that are better suitable for warm sunny weather and higher humidity. Maybe you have oily or combination skin and prefer light products throughout the whole year? 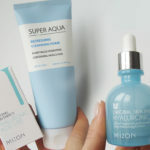 In any case, I’ve tried a lot of different Korean serums over the years, and here are my top best favorites right now. 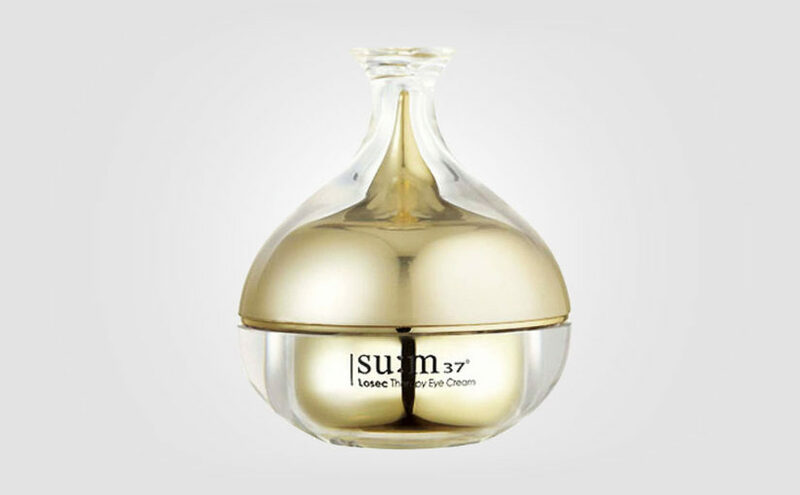 Light fresh serums from Korea, which deeply hydrates the skin without feeling heavy or thick. Leaves no oily film on the skin and all of these serums work well under makeup. 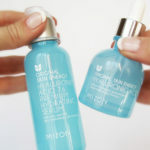 A light and fresh serum that really hydrates the skin in depth. 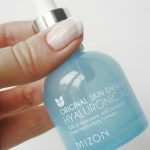 Although the formula is light and the serum is absorbed quickly, Mizon Intensive Skin Barrier Serum still makes a difference to the skin I feel. The serum contains hyaluronic acid with small molecules to penetrate deeper into the skin. The serum hydrates the skin from the inside and out, strengthening the skin’s protective barrier. 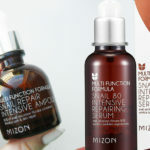 Mizon Intensive Skin Barrier Serum is suitable for all skin types I would say. From dry to combination and oily skin. Also for sensitive skin. Refreshing scent similar to a cleaning agent / citrus, but in a good way. Everybody needs hyaluronic acid in their skin care routine I feel! 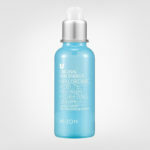 A light moist “watery” serum with incredibly high content of hyaluronic acid, a whole 90%! No scent. 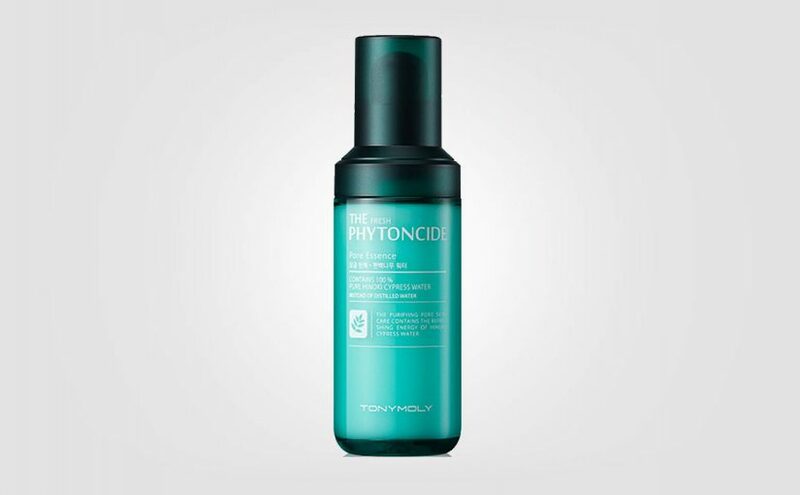 The serum is quickly absorbed by the skin without leaving an oily film. However, the skin does become properly sticky so I would recommend a face cream after using this serum. PURITO Pure Hyaluronic Acid 90 Serum is suitable for all skin types I feel. From oily to combination skin and dry skin. Can be added in any skin care routine at any age. Young and mature skin, acne prone skin or to reduce wrinkles & lines. This serum is a must for you who love hyaluronic acid and want to add pure moisture in your skin care routine. Hyaluronic acid holds more than 1000 times its own weight in water and is an excellent moisturizer in skin care. With strengthening organic ingredients like celery, carrot root and broccoli extract, Klairs Rich Moist Soothing Serum deeply hydrates the skin without irritating or causing breakouts. The serum calms redness and soothes warm, flushed, irritated skin. Light formula. 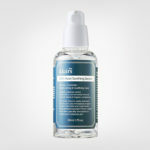 Klairs Rich Moist Soothing Serum feels similar to a light translucent gel and is quickly absorbed by the skin. Fresh refreshing SPA type scent of citrus. Suitable for all skin types and ideal for oily and combination skin types, acne prone skin, sensitive skin and troubled skin. No additives, dyes or added perfume. Cruelty-free and vegan friendly! The bottle is huge with a full 80ml, so worth it! A true Korean classic loved by many. My friend 35+ with mature combination skin has ordered this serum over and over again. A budget friendly serum packed with antioxidants from green tea. Refreshing scent of green tea and pine. The perfect fresh serum for young skin, acne prone skin, combination and oily skin types. Light refreshing feel on the skin. 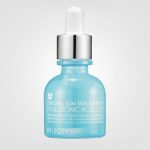 Innisfree The Green Tea Seed Serum is hydrating and works both day and night. Absorbs quickly without leaving an oily film. An incredibly affordable green serum as the bottle is a full 80ml. This product was previously named LJH Lee Jiham Vita Propolis Ampoule. This is a more expensive serum / ampoule in a small bottle of just 15ml. The texture is similar to a dry oil, difficult to explain. Light and not very oily, but still there’s an oil type feel when applying this product. I usually use this serum when I want to look extra fresh and healthy. Perfect as a base for makeup to create glow. Can be mixed in your foundation or BB cream for radiance & moisture. Leegeehaam Vita Propolis Ampoule soothes and hydrates the skin and gives a beautiful fresh glow to dull tired skin. The formula feels incredibly nice and clean. It basically contains propolis from bees and vitamins. Leegeehaam Vita Propolis Ampoule hydrates, moisturises and softens the skin without feeling fatty or heavy. This serum is suitable for dry skin, combination skin and tired dull skin. Also for sensitive skin and acne prone skin since propolis is naturally anti-inflammatory. The thinnest serum in the bunch, and just so incredibly fresh and refreshing. The product feels almost like a toner and serum in one product. Perfect for those who like to apply skin care in layers as the product is very thin. Use as the first serum in your skin care routine. Anti-age treating wrinkles and lines plus gentle exfoliation. If you want something really light and fresh but at the same time hydrating, then Thefaceshop The Therapy First Serum is really something for you. The scent is similar to a cleaning detergent, but in a good way I feel! Super fresh! I love this serum both morning and evening and I like to apply other serums on top of it for double effect. Gigantic bottle of a full 130ml! This essence is supposed to be a dupe for Chanel Hydra Serum. Most expensive serum I’m sharing today, but this is a good one. Wonderful refreshing “Laneige” scent. 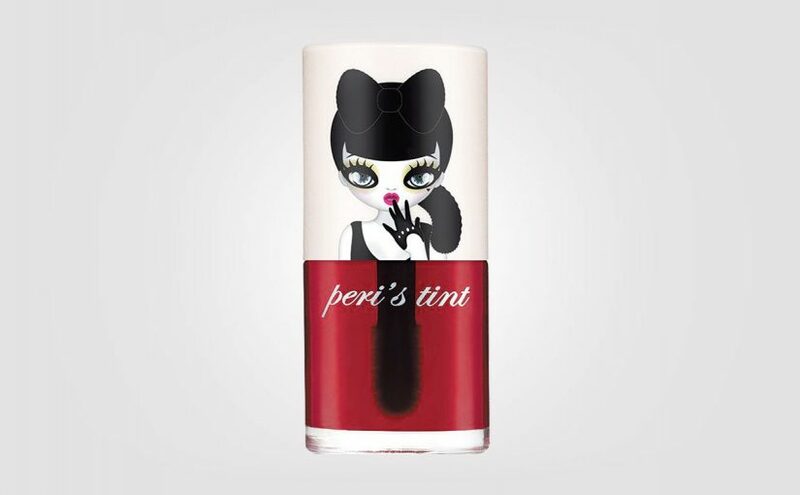 Although this is an essence, the product is similar to a serum as the texture is a bit thicker. Laneige Water Bank Essence EX adds moisture to the skin for 24h using their patented water technology. The texture is similar to a mix between a serum and a light face cream. Unbelievably light and refreshing but at the same time deeply hydrating. Suitable for all skin types in my opinion, and this serum is more premium as Laneige is a Korean middle class brand. 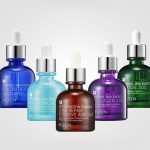 Regardless of skin type, I would say that all of these serums are light, fresh and deeply hydrating. Perfect for the summer!